It's been a little bit since I had last heard from RVIVR. I guess I just wasn't paying as much attention as I should have been as I missed a new 7" of theirs that coincided with a tour of Australia. Luckily for me, the decision was made to also release the 7" on Dead Broke. 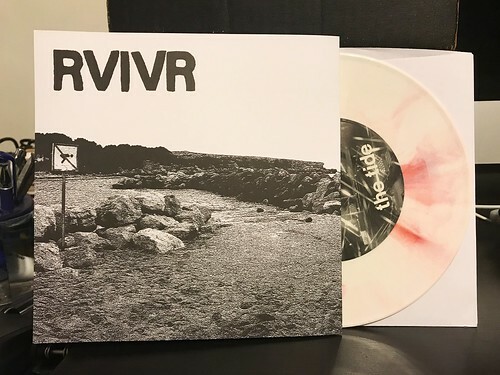 I was paying more attention to that announcement and was able to snag one of the limited to one hundred copies white vinyl versions. Both songs are just outstanding. "The Tide" kicks off with a quick lead guitar riff and then blasts into the verse. Fast paced, chugging guitars with vocal harmonies and sing along hooks. Everything I want from RVIVR amplified to ten. B-side "Shaggy" is just as ferocious with jagged guitar chords and impassioned vocals. Both songs are among the very best the band has ever released. There is mention on the Dead Broke website that RVIVR is also working on an upcoming full length. If this 7" is any hint of how great that album is going to be, it could be the best one yet.